What is the Forum for Nuclear Cooperation in Asia (FNCA)? The 1st International Conference for Nuclear Cooperation in Asia (ICNCA) was held by the Atomic Energy Commission in March 1990 to promote cooperation in the field of nuclear energy with neighboring Asian countries more efficiently. Since then, the Atomic Energy Commission of Japan has held many ICNCAs where the ministers in charge of development and utilization of nuclear energy exchanged frank views on how to proceed with regional cooperation, and has carried out practical cooperation on specified subjects as well. At the 10th International Conference for Nuclear Cooperation in Asia held in March 1999, it was agreed to move to a new framework, "Forum for Nuclear Cooperation in Asia" (including Coordinator and Project Leader System) with a view and information to shifting to more effective and organized cooperation activities. 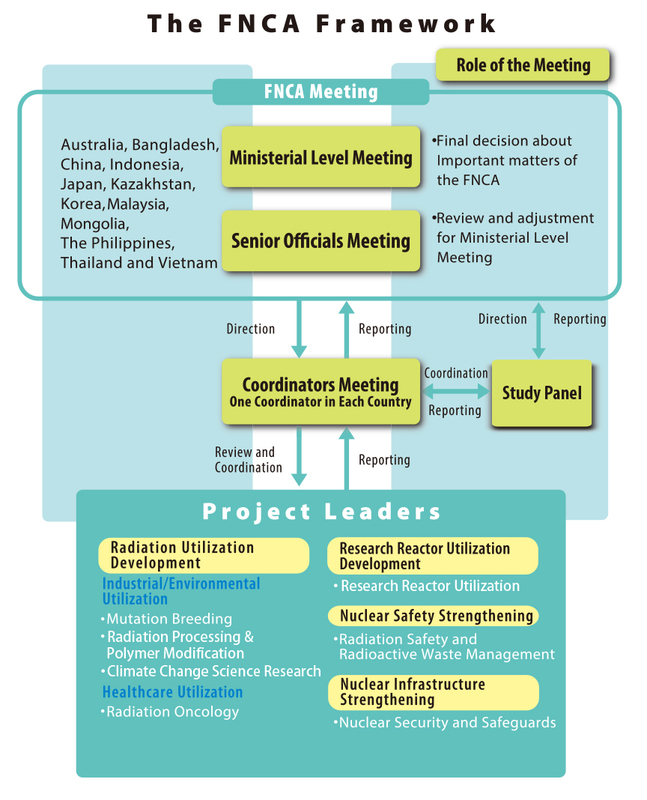 Under this framework, view and information exchanges are made on the following fields: (1) Radiation Utilization Development (Industrial Utilization/Environmental Utilization, and Healthcare Utilization), (2) Research Reactor Utilization Development, (3) Nuclear Safety Strengthening, and (4) Nuclear Infrastructure Strengthening. Forum meeting: Discussion on cooperation measures and nuclear-energy policies. Forum meeting is comprised of a ministerial level meeting and a senior official level one. Coordinators meeting: Discussion on the introduction, revision and abolishment, adjustment, and evaluation of cooperation projects by an appointed coordinator from each country. The 1st International Conference for Nuclear Cooperation in Asia (ICNCA) was held in Tokyo, hosted by the Atomic Energy Commission of Japan. Since then, it has been held once a year in Tokyo. It was agreed to make a developmental transition to a new framework, Forum for Nuclear Cooperation in Asia at the 10th ICNCA. The 1st Forum for Nuclear Cooperation in Asia was held in Bangkok, co-sponsored by the Ministry of Science, Technology and Environment of Thailand and the Atomic Energy Commission of Japan. In fiscal 1991, cooperation activities of Utilization of Research Reactors, Application of RI and Radiation to Agricultural and Medical Use, and Public Acceptance of Nuclear Energy (the name was changed to "Public Information of Nuclear Energy" in 2000) started. After that, Radioactive Waste Management (1995), Safety Culture of Nuclear Energy (led by Australia, 1997), and Human Resources Development (1999) were sequentially launched.